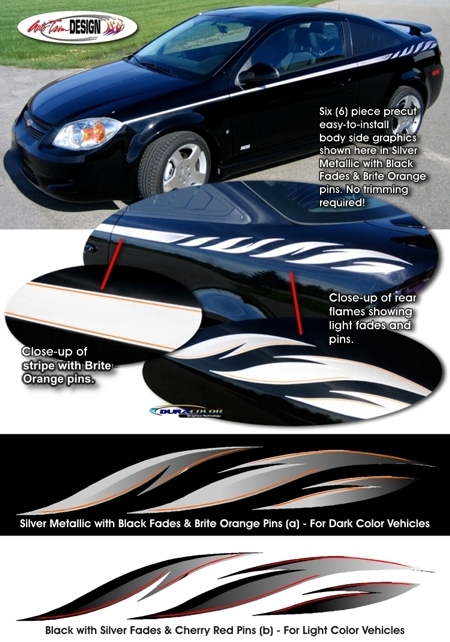 Check out these great-looking Chevrolet Cobalt or Pontiac G5 Coupe Body Side Graphics that will surely set you apart from the rest! Available in two (2) color schemes, this six (6) piece precut graphic kit is ready to install & impress - NO TRIMMING required! Utilizing our DuraCOLOR Thermal Graphics Technology, gentle fades appear towards the end of the graphic and into the rear flames as shown. Brite Orange or Cherry Red thin pins finish out and detail the graphic scheme. As an additional step, graphic pieces are covered with a 2 mil clear laminate which will protect the graphics from miles of abuse. Kit is packaged with one (1) graphic set for each side of the vehicle. Easy-to-follow general online installation instructions and care guide are included. This graphic is specifically made for the '05-'10 Chevrolet Cobalt or '07-'09 Pontiac G5 Coupe and will not fit any other vehicle.